When you start a blog with either blogger or WordPress. The first thing you think about getting organic traffic from search engines like Google, Bing, Yahoo, Ask etc right ? So, to increase traffic on your blog, you have to do manual search engine submission of your blog or site. You have to add url of your blog to top search engines so they can index your blog and in this way you'll also improve seo of your WordPress blog. In this post we particularly learn to submit your site to Google. So, lets quickly see how to submit site to Google. Here, you submit url to Google i.e you add url of your blog in Google Webmaster Tools. Well, Google Webmaster Tools is a free seo tool offered by Google itself to give the publishers how their website is seen by the Google search engine. It basically used for submitting your blog to Google for indexing purpose. In this you will be able to see how many posts of your blog are indexing in Google search, You can catch the crawl error, page not found error etc and in this way you can maintain or improve your site's health. 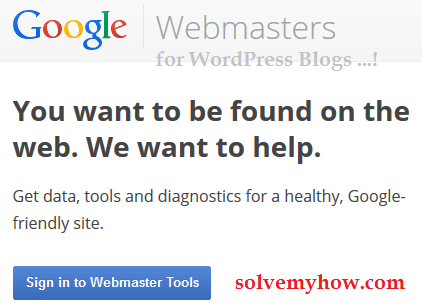 How to add WordPress blog to Google Webmaster Tools ? You need google account to login. If you don't have Google account simple create one and then login. Step 2 :- Submit URL to Google. Just add URL of your blog and Press ADD A SITE button. Step 3 :- Verify ownership of your blog with Google verification code. Now, you have to verify your WordPress blog ownership and you will get one google verification code. Which you have to add on your blog. So, Google can verify your blog ownership. Case 1 :- Recommended Methods. In recommended methods you will get one html verification file. Which first you have to download and then you have to upload it in your website's root directory. After uploading it, again go to google webmaster tools and click on VERIFY button to confirm your blog's ownership. Note :- Skip this method if you found it difficult. Just click on Alternate methods. Case 2 :- Alternate Methods. This is pretty easier then recommended methods for blogs hosted on WordPress platform. The matter of fact is recommended methods are useful for bloggers who are using blogspot platform for their blog. In this method you will get one meta tag (HTML tag), Just copy it so that you can paste it in your blog or website. Step 4 :- Download Insert Headers and Footers WordPress free plugin. Paste the meta tag (google verification code) into header field. Save It. Now, go back to Google webmaster tools and click on VERIFY button. Also try to learn seo and improve search engine optimization of your blog to get more and more organic traffic. Hope you found this article helpful. Please share it with others. So, they can easily submit WordPress site to Google. For more WordPress and SEO tips you can join SolveMyHow on Facebook and you can also subscribe for SolveMyHow newsletter to get answer of every HOW into your INBOX !